What if you knew how to captivate a man, make him fall in love with you, and give you everything you desire? Sound too good to be true? It’s not.You can understand men. You can win their hearts. The good news is, they want you to. Nearly every man I have talked with deeply wants to get married. He wants to adore you! There are many reasons why women have relationship trouble, but the main reason is that women simply don’t understand men. If a woman really understood men, she’d know how to effortlessly attract men like a magnet, make men powerless in her hands, have them treat her like a queen, and give her everything her heart desires. The part of your body that serves as a strong elixir, which men want to be held captive to. No, it’s not your breasts, legs or derrière. Use this part of your body to the hilt and you’ll have him wrapped around your little finger. Shouting/pouting/acting pitiful won’t work – it won’t get his attention, but THIS will What’s the number one problem couples face? Infidelity? Poor communication? No- something else, it’s a proven relationship killer. Learn what it is and how to avoid it. The reason why new relationships fail. It may have nothing to do with your new relationship and everything to do with your old relationship. Learn how to grieve and heal so you’re really ready to move forward with an open heart. 5 things men crave that women don’t know about — Nothing in the world is more exhilarating for a man than these — and if you give them to him, you’ll have his undying devotion. The main reason why men choose to get married (or stay married) to a particular woman. This can be summed up in 5 words. Carve these words in your heart and never forget them. Why some women drive away good men or continually pick losers – How to tell the difference between impulses and feelings so that you’ll never again allow the intensity of impulses to guide you to a poor choice in men. I’ll show you how to find the courage to be imperfect and be loved in spite of it — and teach you how to remove the “layers” that keep a man from knowing and loving you. 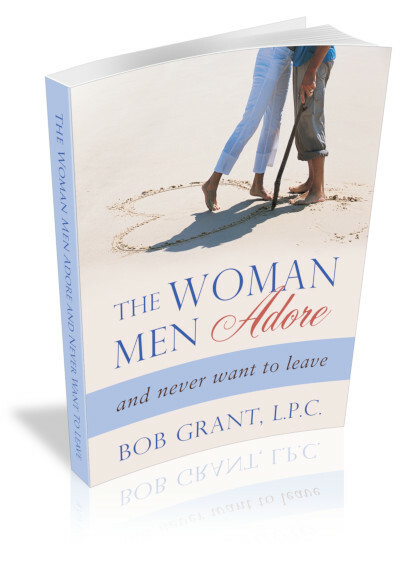 Bob Grant has been providing one on one consultation with women for over 20 years as a licensed Professional Counselor. There’s a reason why Bob receives so many wedding invitations.He specializes in relationship advice that actually works because he approaches it from a man’s point of view. Bob invites women into the world of how men think. Many women unknowingly sabotage their relationships despite their best efforts. Why?Because what works for women does not work for men. Using Bob’s time-tested techniques and new understanding of men, you’ll have the power to captivate a man, be irresistible to him, and make him want to spend his life with you. And you can do all this while being authentically yourself! He is considered a Media Expert on relationships having appeared on numerous radio programs over the years in addition to being a member of the Savvy Miss Dating Team. Residing in Atlanta, GA, he is married to his beautiful wife, Stacey and is the proud father of a wonderful little girl.